I’ve been playing with Google’s Deep Dream Generator on and off for nearly a year now. Well, it’s a post-processor of sorts. You throw it a photo, choose either Deep Dream . . .
. . . or Deep Style . . .
And it works its magic based on settings you choose. 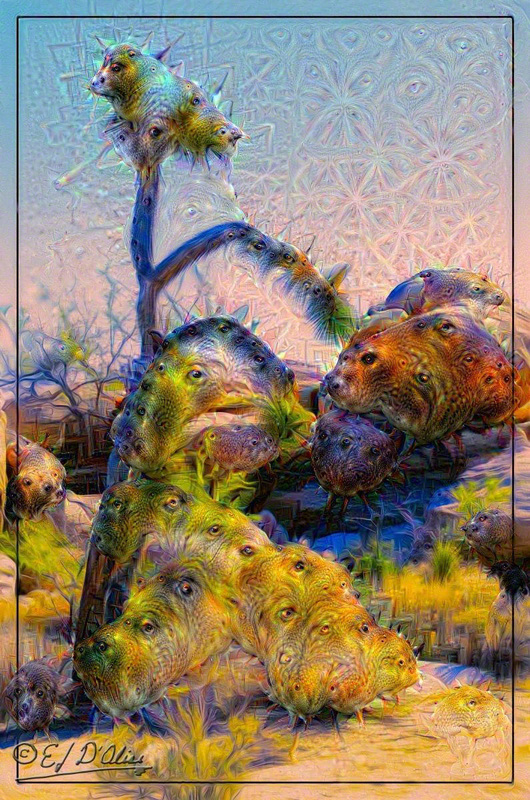 If you want to play with it, these are the links: DEEP STYLE and DEEP DREAM. Those links won’t work unless you have an account; they will instead throw you into the signup page. Once signed up, you can easily choose Dream or Style. Yes, you need to sign up. You can use your Google ID, if you have one, or just use another e-mail. Be aware that you can get some weird things. 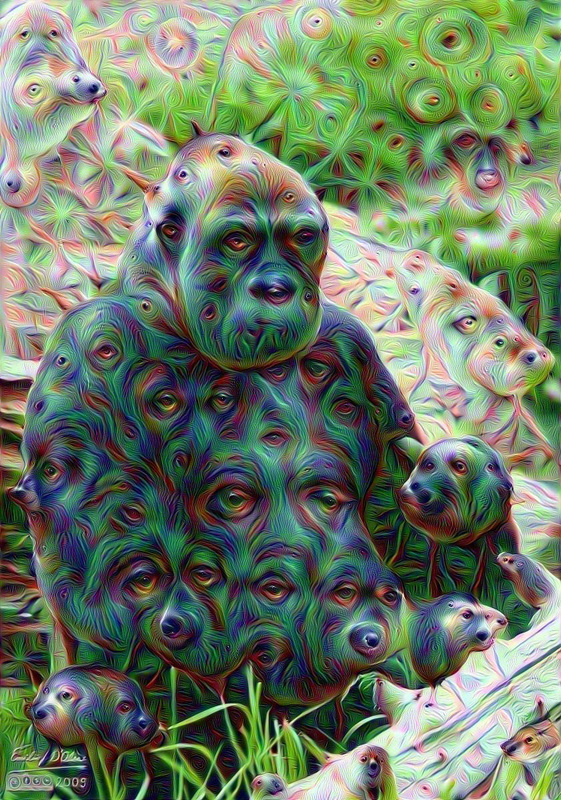 For instance, certain settings of Deep Dream will get you lots of dog-like faces . . . Some of them quite interesting . . .
Here’s an article as to why that’s the case. Below is the gallery of what I’ve done so far. It’s not much because I only occasionally play with it, but it’s interesting seeing what you get by changing the settings and styles and other parameters. Some are boring, the result of experimenting with the various settings. All of these are photos that have appeared on this blog. You might even recognize a few. Since I did not make my online gallery public, only my readers get to see my Deep Dreams. Edited To Add: There is a public gallery where people post their works. Some of them are quite striking (much better than my drek). The gallery is HERE and you do not need an account to view it. This entry was posted in Photography Stuff and tagged Google Deep Dream, Photography, photography stuff, post-processing. Bookmark the permalink. You can bet your boots that I’ll give this load of codswallop a miss! I’ll retain what little sanity I have left thank you very much! Well, I sold my boots when we moved here, so I can’t bet them, but I had a gut feeling (I still have one) that in your heart (however it’s doing) this would not be up to your standards of creativity. As for worrying, you shouldn’t worry about imaginary things. However, thanks for dropping by and checking out what you’re not gonna look at. was that a typo? Surely you meant down and not up? You can add as little “weight” as you want to both the style and the application of it. There is a public gallery that has more nuanced and interesting processes than the slop I did. This is the public gallery (you can enter it without having an account). Some really interesting and striking stuff. Interesting. Some of the pictures gave me a bit of a headache, but I love the buffalo! There’s a number of those I like but I would likely tweak the effect some more. I’ve not worked out the various combinations (there are a lot) but I’m envious of some of the results I’ve seen. Of my efforts, there are a few I really like and a few more that look interesting. The rest are too different to appeal to my tastes.
. . . not sure about getting a headache from them, but I’d not thought of weaponizing them . . . hmm . . .
I’ma gonna check this out. You shudda definitively do that. There’s an option where you can input your own photo for the algorithm, but I’ve not tried that yet. incredible!! A couple of them reminded me of paintings by – well- mad folk!! But I love them! It’s worth playing with. Check out the public gallery; some very nice stuff there. The public gallery is way too wild for me. As you know, I prefer the “painterly” styles, so all those in your gallery that fit that style I found interesting and beautiful. All those with “eyes” and such, did not. I think what you do with the Topaz plug-ins is fabulous. The eyes have it . . . yeah, I don’t like those either. I did find many in the public gallery interesting. Yes, there are also some wild ones there, but I thought it a worthwhile view. Topaz has many more controls than Deep Dream, so I can tweak stuff more. Okay, the many-eye-ball-ed gorilla (and friends) freaked me out for a bit. But, the rest are wild, unique and cool! Some of them make me think of very specific painters that I love! It’s different, I’ll give it that. I had noticed the awolness, but also saw you responded to some comments in your usual cheerful way, so I figured you were just busy. Thanks for noticing my awolness! Yes; that’s when they don’t give a hoot.
. . . try looking at them with only one eye open. It’s just something that might occupy a few minutes here and there. Something else to play with. Not enamored with it, but thinking it might be fun to play with depending on particular photos. I’ve been visiting the gallery you linked to for quite a while, a year or two maybe. Suddenly it’s gone. I tried to email them to ask what’s happening, but the email bounced. I found this page looking for an explanation of what’s going on. Do you know how to access the gallery? Or do you have any downloads of it you can send me? Not sure what you’re asking. The site is there, although it’s been redesigned (most websites love to redesign their pages, often messing them up in the process). You still need to login to access the tools and the galleries. I don’t like the new interface much, but once you get in there, you can get to the same tools. I don’t see some of the Dreams I had done, and I don’t see as many as I used to see so I don’t know if they are limiting what’s kept. As for downloads, I don’t download other people’s work but you should be able to get in there and do so on your own. Ah, I see what you mean. The public gallery is no longer linked. You get a small number of examples, but to access more you need to sign up or login.